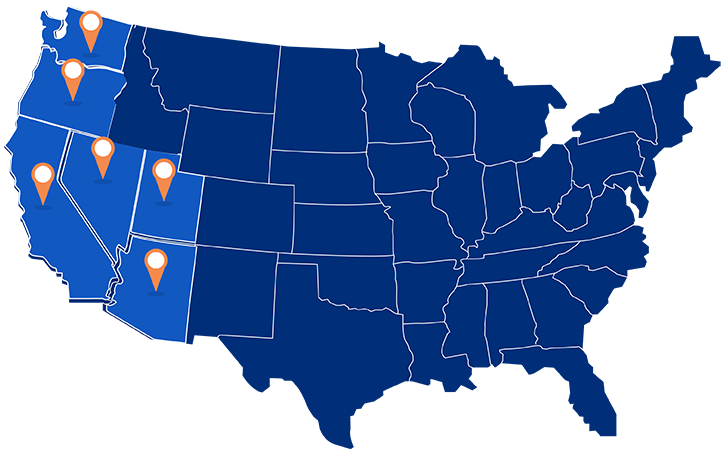 LandCap Investment Partners is a private real estate investment firm committed to generating attractive risk adjusted returns through Reimagining & Revitalizing Communities across the Western United States. Founded in 2010, LandCap started as a real estate investment firm focused on distressed land & redevelopment mixed use assets. Since its founding the firm has made 19 acquisitions to date & has successfully exited multiple projects providing significant investor returns through a proactive value-add approach including entitlement, re-entitlement & development. Today, LandCap continues to invest along its opportunistic focus & has expanded into investing & managing income properties including: In-fill residential, mixed-use, commercial & retail. PROACTIVE VALUE-CREATION: LandCap believes that at this stage in the real estate cycle it is mandatory that a manager create value rather than rely on market growth. 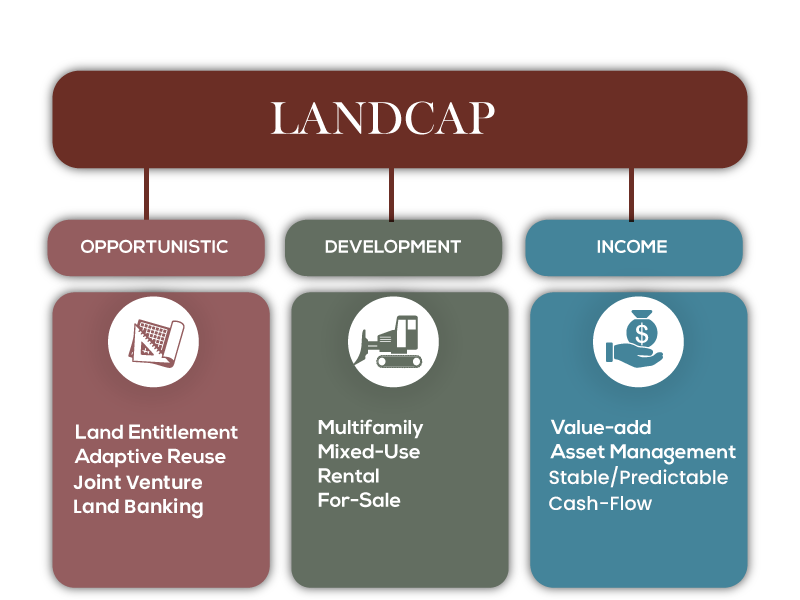 LandCap has a dedicated investment and shareholder value creation strategy focusing on real estate fundamentals and a diverse set of value-add opportunities. Through investing across our three verticals we provide a unique combination of stable cash flow, downside protection, and potential for capital appreciation. Over 40 years of experience in the real estate industry as an entrepreneur, corporate lender, mortgage banker, private equity and private investor. * Senior Managing Director of KeyBank Private Equity Group, investing over $400 million of equity and mezzanine capital with a total project value of $3 billion. * Founded Centre Trust Advisors / CTA Capital Partners, primarily focused on housing sector investments. * Founder of two mortgage banking firms. C Level management experience. Over 35 years of experience in real estate as an investor, developer, and builder. * Founded Jeffrey Homes, which entitled, developed and built nearly 1,000 housing units. * As COO & CFO, Jeff grew the company to over $50 million in annual revenues with projects ranging from commercial office, senior community centers, and numerous housing types ranging from single customs to large residential subdivisions. California has become one of the most expensive cost of living states in the nation and the economic and political environment has been driving both businesses and families out to the surrounding states. We believe there is a significant opportunity to provide affordable housing options in California as well as take advantage of the population and job inflows experienced by the surrounding states. Description: 1-acre Vacant lot with house Next door to Square One "Off Market"
Business Plan:Presently a leased parking lot to a corporate user. Entitling for 50+ units of housing. Description: 40-acre , infill site - 3 contiguous sites, 2 sellers "off market." Business Plan: Entitle to 350 to 400 unit / lot Residential Community. Description: 94-unit multifamily rental plus 10,000 sq. ft mixed-use, 7 story buildings "off market." Business Plan: Complete commercial rent-up/ stabilization, 4,700 square-feet of vacant ground floor to lease. Description: 24,850 square-foot existing mixed-use 3 story building "off market." Business Plan: Reposition and re-tenant 90% leased. Description: 8.6 acres raw land "off market." Business Plan: Entitled in 2016, 148-unit townhome community. Description: 20 acres "off market." Business Plan: Re-entitled from 98 SFR lots to 312 multifamily units two story walk-up. Business Plan: Re-entitled from 142 SFR lots to 324 multifamily units, 2-story walk-up. Description: 20 acres improved land, two 10-acre sites "off market." Business Plan: Entitled in 2014 for a 620-unit multifamily development. Description: 2.5 acres improved land, "off-market." Description: 6 story, 208-unit hotel redevelopment to 100 apartment units "off market." Business Plan: Entitled and re-developed 100 rental apartment units, completed 8/2016. Description: 3 story, 110,000 square-foot former casino building "off market." Business Plan: Entitled 2016 for Mixed Use Retail / Commercial Ground Floor Retail 2nd/3rd Floor Office. Description: 21 acres raw land "off market." Business Plan: Re-entitle from industrial use to 150 single family lots. Description: 4.25 acres plus parking structure "off market." Business Plan: Entitled 2015, 209-unit luxury rental multifamily 5-story wrap / structured parking garage. Description: 103 rented condo units "off market." Business Plan: Currently selling units at $250/sq. ft 87 units sold, 85 closed. Description: 240-unit multifamily rental, 2007 vintage "off market." Business Plan: Value-add renovation increasing rents moving NOI above $1,000,000 in 18 months. Description: 3 office buildings, fully leased 5.5 acres "off market." Business Plan: Re-entitled for highest & best use, 312 multifamily units & 7 live/work units. Please contact LandCap for more information about its investment strategy and current investment platforms.